I was just not well prepared this morning and I think it kind of showed. I went to bed fairly early last night, but earlier I had been trying to work out some problems in Part 2 of the story. I’d sketched out where the part started and where it would end and tried to figure out how to get from start to finish while keeping the reader interested in what was going on. It made me rethink of some of the chapters I’d outlined, but I didn’t have time to actually make changes to the outline. I woke up at 4:30, bleary-eyed and still feeling slightly under the weather. Originally, it was my intention to write the scene that I didn’t get written yesterday. But this morning that scene didn’t feel right at this point in the story. And I hadn’t outlined in any great detail any of the chapters beyond that scene yet, all I had was a paragraph of two on each So I literally sat in front of my laptop for fifteen minutes, staring at a blank screen, uncertain what to write. It’s the first time that’s happened to me this NaNoWriMo. I finally decided to jump slightly ahead in the story to get things moving and that’s what I went with. I ended up writing two scenes, neither of which are great, but I got them down on paper as markers. The writing started out slowly but I picked up some steam as I went along. 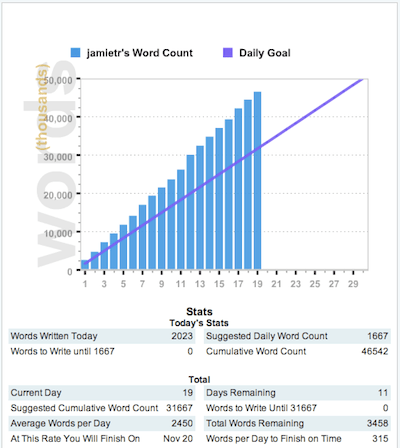 I managed to write 2,203 words, barely continuing my 19-day streak of besting my personal goal for each day. It brought my 19-day word count to 46,542 words. Since I am aiming for a 90.000 word first draft, today officially puts me at more than halfway done. I have less novel to write than I have already written. This is a good feeling because it means that I know I can achieve what’s left to be written. I’ve already written 46,000 words and I know what it’s like to do that. All I need to do now is keep plugging along. At this rate, I should finish up in another 18 or 19 days, which assuming the latter, puts me at December 8 for a complete first draft. One thing is clear. My outline for Part 2 needs some serious fleshing out for the ten chapters that remain. I’ll need to work on that today so I don’t run into the same kind of problems tomorrow. In the meantime, I feel like I need to do some kind of little celebration, rewarding myself for what I’ve managed to get done so far. I’ve written half a novel! Yay me!